Status: offline My eyes are initially drawn toward the hamate where it borders the lunate. Maybe at the distal kind of lateral navicular? I can't really tell though. Status: offline Looks like there's a little somethin' somethin' at the medial hamate. Status: offline The 1st proximal phalynx looks like it has a fx right at the joint line, on the ulnar side. Status: offline I agree something like a fx at the medial hamate. 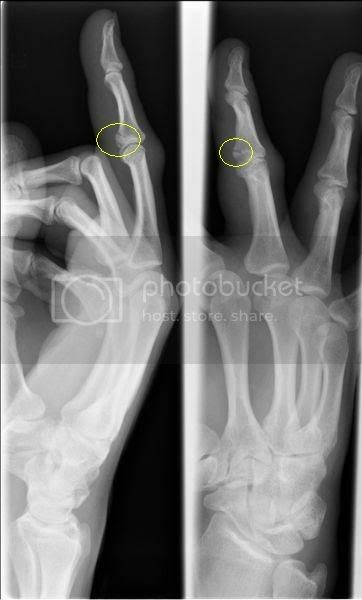 Im also curious about the ulnar side of the 1st proximal phalanx. Status: offline ditto, would have to say this would not be the view to look at the hammate, but that proximal side does look like small fx., was looking for somse soft tissue swelling to give this away, but cannot find it, let me ask you this though. Seeing the Fx or not seeing the Fx, would your treatment differ? Status: offline Ha Ha! you got us, Alex! ...so there isn't a fx of the hamate, huh? Status: offline OK I'll take a stab at it. 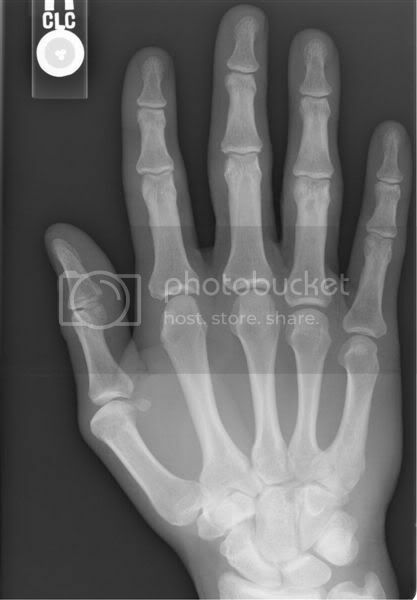 Distal - Medial aspect of the proximal 5th phalange. ??? Status: offline Falls, isn't it the infamous middle finger? Status: offline I was looking at the first view. But is IceBox Days this week so maybe I had a brain freeze. Status: offline ...still seeing it....Do I need to change my meds? Status: offline I see it as well. Were we close or far off Alex? Status: offline There is a nondisplaced, incomplete, oblique fracture through the palmar aspect of the base of the third middle phalanx with mild adjacent soft tissue swelling. No other osseous or soft tissue abnormalities are noted. Status: offline Thanks for the clarification Alex. Keep them coming!